If you’ve purchased a flat-screen television in recent years, you’ve probably noticed that picture quality and ease of installation have vastly improved over the years, and that they’ve become more affordable. Well, the same can be said for colour projectors. A product that was once reserved for professional presentations or the most advanced of home theatres has quickly become a viable option for anyone that has the space to accommodate a projection screen. Gone are the days when having a projector meant rewiring your entire home or office and fiddling with difficult-to-understand parts and directions. Projectors can be installed easily and obtained for reasonable prices, making them far more common than they used to be in both business and personal settings. There are many quality projectors available, but we are currently focusing on the BenQ MH535A DLP Colour Projector for Home and Office. This versatile projector packs quite a punch and should impress anybody who is looking for a crisp, clear picture with great resolution and brightness. With HDMI and USB connectivity, this projector provides quick, easy set up, and should be and running in no time for even the most inexperienced installers. The reward after your minimal-fuss installation, of course, is a brilliant, full HD 1080p picture that will stay bright for a long time to come. Whether you’re using this to watch blockbuster action films with your family or to give stunning presentations to clients, you will likely find that this is one remarkable piece of hardware. Who should buy the BenQ MH535A? While this projector boasts plenty of versatility and creates an image that is great for both home and office use, there are certain people who will stand to benefit more than others. Ultimately, this is a fantastic presentation projector that will provide plenty of functionality for businesses who rely on digital presentations for client-facing and training purposes. The sharp pictures will impress customers and co-workers alike, and the ease of use, as well as multiple ports, will keep presentations flowing smoothly and looking pleasant from start to finish. The BenQ MH535A may be optimized for an office environment, but that doesn’t make that it can’t be part of a fantastic home theatre system in the right setting. Because it projects a 120-inch image from 11 feet, 11 inches, it is ideally suited for a large room with a clear, undisrupted viewing surface. In other words, if you live in a small apartment, this is probably not the home entertainment system for you. The picture looks best when the projector can use its full potential and forcing it into a small room will only cause clutter and degradation of picture quality. The BenQ MH535A is the second brightest of BenQ’s HD projectors, boasting 3600 lumens of brightness and offering plenty of other features and specifications that are sure to keep any videophile more than satisfied. First, we’ll take a look at the specs and then explain what they might mean for you. The MH535A comes in a pretty standard size as far as projectors are concerned. At just over 5 pounds in weight, it is easily manageable from the beginning to end of the setup process. It also offers the advantage of being relatively portable, meaning you can transfer between offices or between the office and home with ease. As we mentioned before, this is the second brightest of BenQ’s offerings, and at 3600 lumens, you will enjoy more than enough brightness for presentations in any atmosphere. Whether you have a windowless conference room in the centre of a building or floor-to-ceiling windows bringing hours of natural sunlight into a corner office, this projector is going to look great! Taking notes and collaborating with fellow employees will be a breeze, but this machine will also project a beautiful image in a perfectly dimmed home theatre. Using DLP technology, the BenQ MH535A provides a striking 15,000:1 contrast ratio. This leads to superior clarity and seemingly impossible crispness, allowing you to read any text cleanly and clearly without straining your eyes. Graphs and charts will exhibit the deepest, brightest colours and some of the truest blacks that you can get from a projector. All of these means that your presenters and viewers alike will enjoy top-of-the-line picture quality throughout the life of any meeting. While not quite pushing the limits that 4k can bring to picture quality, the 1080p ability still makes for a tremendous picture at an affordable price. This is Full HD 1080p with two-megapixel high resolution, so you won’t be missing on brightness, clarity, and reliability. You’ll definitely notice the quality when you zoom in on pictures or graphs in presentation, as there will be little to no degradation of quality in the picture. The ability to display over one billion colours really helps your pictures to pop and your videos to stand out above the rest. The true-to-life colour ability of the projector will wow most viewers for years to come. Rich, effervescent colours will adorn the entire screen, letting your slide shows and movies alike draw in your audience. This is pretty standard for a projector and means that you’ll be able to use it with any standard power source without having to worry about converting outlets. The BenQ MH535A provides you with 3 options for power saving, and you can see that you’ll get plenty of life out of this little machine even if you don’t choose to maximize your efficiency. But why wouldn’t you? In SmartEco Mode, the projector analyzes your image and video content before automatically choosing a brightness level that will specify performance levels for the highest quality picture available. This saves up to 70% of your lamp power, giving you a far longer life than a projector without power-saving modes. The machine will also save energy by activating the Eco Blank Mode after 3 minutes of inactivity with no content. So, in case you forget to turn it off or if you’re taking a break from a presentation, the machine will take care of power economy on its own. It will also shut off automatically after 20 minutes of inactivity. This is a life saver if you get called into a different last-minute meeting and completely forget that you had the projector on! This is an often overlooked but highly valuable feature of the MH535A. Say you have a meeting that is going to require multiple presentations from different people, all of whom have different machines and connections. You can plug them all in at the same time, eliminating the need for the fuss of switching around between presentations. This makes your entire meeting more streamlined and convenient for everyone involved. Simply click a button to switch between displays, so you can even bring up parts of another presentation without any hassle. Desktops, laptops, and even mobile devices with USB connectivity are all supported. On top of its basic specifications, the MH535A offers a variety of other features that make it intuitive and easy to use, even for beginners. Many projectors suffer from a trapezoidal effect when projecting from a less-than-ideal setup. This can happen when it must be placed off-centre, on top of a platform, or even if it’s just being used in a room that is considered too small or large for optimal viewing. BenQ’s Vertical Keystone feature automatically counters this effect and creates an image that is perfectly square and correctly aligned, preventing any distortion to your images and videos. There are three adjustable feet placed around the bottom outside of the projector, allowing you full control over the angle and placement of the machine. While many other projectors only come equipped with one foot, the MH535A provides a customizable experience and superior ease of use when compared to competitors. You won’t have to spend time unscrewing and replacing the lamp door, because this one flips off easily, letting you get to the lamp for any sort of maintenance or replacement that may be required. Even if your projector is mounted to a platform, you won’t have to waste hours uninstalling it just to get to the lamp – you can get there quickly thanks to the sleek design of this machine. The wireless remote offers a quick install button so that you can access functions and install them immediately. You won’t have to deal with the hassle of going through multiple menus just to install a display function – you can get it with the simple click of a button. As with any high-tech machines, there are going to be some advantages and disadvantages when compared to its competition. Overall, we find that the MH535A is an excellent projector with many benefits, but we advise you to consider the upsides and shortcomings to determine if it is the right machine for you. 3600 Lumen High Brightness – This is a major advantage, whether you are giving presentations during a bright, sunny day, or screening an adventure film in your home theatre at night. You’ll have no trouble seeing what you need to see thanks to the 3600-lumen capability of this machine, making for effervescent, detailed images and videos. 15,000:1 High Native Contrast – There’s just no beating this quality, which makes text readable, graphs crisp and clear, and images easy to see. Preventing strain on the eyes is a huge benefit for anybody who happens to be viewing your presentation. HDMI and VGA Connectivity ­– Let’s face it, nobody wants to waste time when they are going through presentations, and this feature, while easily implemented, saves a whole lot of time. Connect up to four devices and easily switch between laptops, desktops, and even mobile phones as your meetings run smoothly and without hassle. Plethora of Media Capabilities – You’ll be able to show videos, pictures, and full-length movies from a variety of media players, including Macs and PCs as well as digital cameras, iPods, and cell phones (provided that you have the proper connections). Highly Versatile – As mentioned, the brightness capability and customizability of this projector make it a versatile machine that can be used in both the home and the office. Crisp, readable graphs and charts provide for great presentation material, but it also handles 1080p video with grace and clarity, making your viewing experience exceptional in either atmosphere. Easy to Use – Because of its many additional features, this is an easy-to-use device that won’t require much tinkering or maintenance. From Vertical Keystone which automatically squares up the image to an easily accessible lamp for quick replacements, you won’t have to worry about spending valuable time getting this projector to work. You’ll basically just have to turn it on, and it will be ready to show whatever content you provide it with. No 4k Capability – 4k is the wave of the future, and unfortunately the MH535A doesn’t reach that high. Still, you’ll be spending a lot more on any 4k projector, meaning that this is still an excellent value. Speaker – The built-in speaker leaves a lot to be desired for cinema viewing. It is only 2W and will not provide a strong viewing experience if you are relying on it for home use. It is quiet, tinny, and overall just a low-quality speaker. It might work just fine for a short presentation, but if you are relying on sound and music for videos, you will need to utilize an external audio source to have an exceptional viewing experience. Darkness Required for Home Use – if you don’t have blackout curtains or a windowless theatre, you may notice some degradation in quality of the picture. The projector will perform best for cinematic video when you minimize any sort of natural or ambient light. What is an alternative to the BenQ MH535A? While we give the BenQ MH535A our stamp of approval, you may find that it is not quite the right projector for you. If you want to a solid alternative to this projector, we recommend the Optoma HD27e Home Theatre Projector. While this projector doesn’t provide as many lumens of brightness (3400 vs 3600), it beats out the BenQ when it comes to contrast ratio (25,000:1 vs 15,000:1). This makes for excellent crispness and clarity that may be more noticeable for the home theatre user than someone using it for office presentations. However, it will still make for a great conference room projector. Other than the brightness and contrast ratio, the specs and price are very similar between the two. We prefer the BenQ MH535A, but the Optoma HD27 is still an impressive machine and may work better for some people with different preferences. As the price of projectors continues to come down and the quality gets better and better, many people are opting to use them over standard flat-screen televisions. If you are considering going this route for your home theatre or conference room, it is hard to beat the BenQ MH535A when it comes to brightness, clarity, picture quality, and value. This easy-to-install and highly versatile machine would make a great addition for any home or office. Whether showcasing graphs and images of new products for customers or entertaining your friends with the latest popcorn flick, the MH535A is going to get the job done in a wonderful way. The machine isn’t without its shortcomings, but we find that the advantages of the machine far outweigh the negative aspects that come along with it. 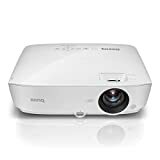 It is also a highly efficient machine that maximizes its use of energy, so you’ll be getting a projector that will last for years and will continually deliver gorgeous pictures and video. It may not offer 4k video, but the 1080p powered by 3600 lumens and a 15,000:1 contrast ratio means that you’ll still be getting some of the highest-quality images that money can buy. Overall, this is a machine that will be a perfect addition to a home theatre or an office conference room, and we believe that satisfaction levels will be high for everyone that uses it.